Welcome to Turbulence Training Day 5. Home fitness workouts that'll burn fat and sculpt your body in 4 weeks. 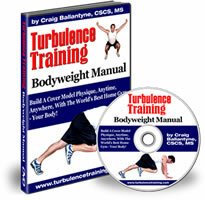 This is day 5 of Turbulence Training's Buff Dudes and Hot Chicks fat burning workout. "Hello and welcome, I'm Asad from Better4Fitness.com, and today's day 5 of the Buff Dudes and Hot Chicks workouts. First of all, let me apologise for my shiny face(! ), it's a nice sunny day here in London. You can see today's workouts down below, just there if you're on Better4Fitness.com, if you're not then GET THERE and you'll be able to see the supersets and what order they came in today. Today's workout was the famed upper and lower body split routines, with some core involved as well. And I'll tell you, it's pretty tough today, found it really hard! 1) First of all was a lack of sleep. And that is a huge mistake, the number 1 cardinal rule which I talked about on day 2, you need your sleep! And unfortunately last night I was working late, it's my own fault I didn't get enough sleep. So I suffered for it today. I could really feel it as well, I felt lethargic in the workout and my body just didn't want to know. 2) Secondly, I think there was a psychological aspect to it. Obviously when I downloaded the workouts, I had a look through each of them and day 5's workout was playing on the back of my mind. I knew it would be hard. And maybe because I thought it was going to be hard, it became a reality and it felt hard as well. Whereas if I'd gone into it with a more positive attitude, then I might have got more out of it. 3) And thirdly, you gotta remember it's designed to be tough. It's the first week, so by the fourth week you should be able to do the whole thing. Whereas in the first week you're not expected to do the whole thing. And you shouldn't expect too much of yourself too soon, because that will lead to injury. So that's why I missed out a few sets today, my body was suffering, I listened to it and I tried to push myself as far as I could (within safe limits). That's as far as I went, I didn't push it further. So now I'm really glad for the weekend break, both days are rest or recovery days. I'll be doing some light exercise over them but nothing too strenuous, I'll let my body recover from today and the rest of this first week. It's been a good week so I look forward to Monday (day 8) as well. Stay tuned for the speedy mash-up of today's workout. It's a really good one today because I really suffered and you'll be able to see that! So here it comes and I'll see you on Monday, take care."